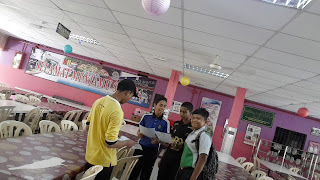 This blog was created to share the documentation of service as action and community services done by Maktab Rendah Sains MARA Balik Pulau as one of IB World School Candidate. It is also as a medium between the school and the students in managing the service as action programme. This blog is running by individual requirement and not represent the school officially. You can subscribe the school official website http://www.mrsmpb.edu.my for further information. The effort to promote service as action has been organizing in the school through information board and spreading the message of IB to the non-academic staff. A small groups of some students were appointed by the coordinator of service of action to spread the message and IB information to the staff to make sure that all the school citizens understand about IB programme. Finally, the verification session was running at 30 Mei and 1 Jun 2018. That time was a very sweet memories to us because all the 4 years effort finally evaluated by the verification team from IBO, Mr Werner and Miss Katherine. 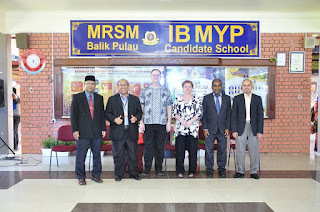 Hopefully we will succes to become an IB World School soon. · Provides students with opportunities for helping the school, local, and international communities. · Helps students apply academic, personal and social skills to improve the community. · Develops an awareness to make a positive difference in the life of others · Encourages responsible citizenship by increasing students understanding of the world. · Allows the student to discover new skills, talents, and interests. · Helps students develop as leaders who take initiative. The goal of Service as Action is to meet the Service as Action Learning Outcomes. 1. Investigating Student can define a clear goal and global context for the service and action, based on personal interests. 2. Planning Student will develop criteria for the product/outcome. 3. Taking Action Student will create a product/outcome in response to the goal, global context and criteria. This is the benchmarking visit to learn about Personal Project from Fairview International School (IB World School) Bukit Jambul, Penang. The students were enjoying the visit and hope to produce their Personal Project as best as their peers did in that school. The team go back to school and share their experience in that session with their friends.